Subscribe to the OVYM Email Newsletter and receive announcements and updates right in your inbox. February 2019 The February issue has a messsage from Martha Viehmann, the OVYM Clerk and a reminder to save the dates of June 19-22, 2019 for the OVYM 2019 Annual Sessions. There is also a reminder about the Middle Youth and Teens Program at the upcoming February `7th Mimami Quarterly Meeting. You will find information from AFSC News and Resources, FCNL, Indiana Yearly Meetingt, FGC, and AFSC Midwest Digest. Of course, Monthly Meeting News are also in this issue. Finally, you will also find the Proposed Sections to the OVYM Faith and Practice to be reviewed. September 2018 The September issue opens with the 2018 Yearly Meeting Epistles. There is a Reflection by Yearly Meeting Clerk, Martha Veihmann, the announcement of World Quaker Day (October 7th) and the October 20-21 Joint Quarterly Meeting at Happy Hollow. Paulette Meyer and Diann Herzog's letter on Traveling and Eldering in a Ministry of Song, News from Monthly Meetings, and many other important and interesting offerings are in this issue. June 2018 June announces the 2018 Annual Sessions, Sharing the Light: Radical Love for the World, Greetings from the Clerk, several great articles and announcements, edited sections for the Faith and Practice, and news from the Meetings. February 2018 Features the following: the 2017 OVYM Annual Sessions: Share the Light: Radical Love for the World, June 13-17 at Earlham College, the 2018 Friends General Conference Conference in Toledo OH July 1-7, "Thoughts upon my Return from Africa," by Anne Hutchinson of Oxford Meeting, AFSC News, IFCL and FCNL news, an article by Cecilia Shore on Supporting a Ministry of Quaker Spirituality in Music, and news from Monthly Meetings. October 2017 opens with Greetings from the Clerk. The October issue includes the 2017 Annual Sessions Epistles, Q&A from Simply Speaking, an update on Quaker Heights Care Community Construction, an article on Intervisitation and New Life Among Friends, an article on Quaker Social Change Ministry, updates from Friends General Conference, and news from Monthly Meetings. June 2017 is a loaded edition. It opens with an announcement of the 2017 Annual Sessions and Greetings from the Clerk. The Fort Ancient worship and picnic, the 2017 Westheimer Peace Symposium and Ohio River National Freedom Corridor Conference are announced, and there is an article on North Meadow Circle's collaboratoin with the Kheprw Institute. Noted and Queries from the February Miami Quarterly Meeting are shared and Indiana Yearly Meeting added their recent news. 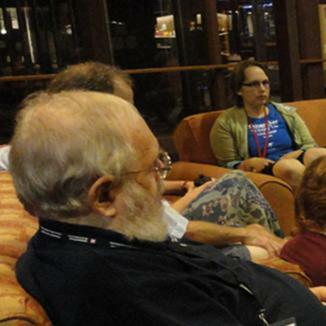 There are resources for Meetings from FGC, exhibitions at the Quaker Heritage Center, and announcements from other Quaker Organizations. Monthly Meetins submissions close out the issue. February 2017 opens with Greetings from the Clerk. There's an announcement of the OVYM Spring Retreat in Indianapolis, an Epistle from Quaker Women in Public Ministry, Faith and Practice sections for review, photos from the October Joint Quarterly at Camp Kern, and News from Monthly Meetings. October 2016 announces our Joint Quarterly Meeting at Camp Kern, Oct 29-30. There is a call from the Annual Sessions Planning Committee for new members to help with the planning for next year. The Epistles from our most recent Annual Sessions, a Greeting from the new Clerk, and Monthly Meeting News rounds out the issue. June 2016 announces our July 27-31 2016 Annual Sessions at Earlham, including the Faith and Practice revisions, information on the Program and Presenters, the schedule and registration forms. There's also news from the Monthly Meetings and from around the Quaker world, and the announcement that OVYM is seeking a Youth Secretary. February 2016 features a greeting from the Clerk, OVYM's participation in the FWCC in Peru, the call for input by the Budget and Finance Committee, fossil fuel divestment, important information from the Faith and Practice Committee, and Monthly Meeting News. June 2015 has all that you need to know about the 2015 Annual Sessions, including the forms required for registration. There are also articles on Miami Quarterly's passage of the Minute on Divestment in fossil fuels, an appeal for contributions to the Yearly Meeting, news about Quaker Heights' new Rahab Wing, and the usual news from Monthly Meetings. 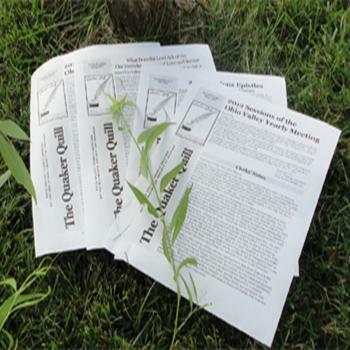 February 2015 has Quarterly and Monthly Meeting news, a poem, entitled the Challenge to be Patient, American Friends Service Committee 2014 Highlights, information about the 2015 FGC Conference (July 5-11 in North Carolina), new construction at Quaker Heights, and the latest from the Quaker Heritage Center. October 2014 contains the 2014 OVYM Annual Session Epistles, greetings from the Clerk, and articles on the Quaker Diversity Event, the Quaker Heights ground breaking, and news from Monthly Meetings. June 2014 with all that you need to know about the 2014 Annual Sessions, including the program and the forms required for registration. There are also the regular articles from individual Monthly Meetings that are a normal part of the Quill. February 2014 opens with a greeting from the Clerk and Phillis Martin's Quaker Convincement. There's also an article on Olney Friends School's decision against "fracking" on their property, and news from Quarterly and Monthly Meetings. October 2013 contains lots of good information, including news from the Executive Committee, the OVYM Epistle, News from Monthly Meetings, the final word on Faith and Practice Close Relationships Part II, and the OVYM Statement on Abolishing Nuclear Weapons. June 2013 with all that you need to know about the 2013 Annual Sessions, including the forms required for registration. There are also the articles from individual Monthly Meetings that are a normal part of the Quill. June 2012 about the 2012 Annual Sessions, including the forms required for registration. February 2012 with information on the 2012 Teens Service Trip to Washington DC, News from the Treasurer, Quarterly and Monthly Meeting News. October 2011 contains the Episgles from the 2011 Annual Sessions. June 2011 announced the 2011 Yearly Meeting and an article from the Clerk on "Yearly Meeting as an Extended Meeting for Worship." February 2011 announced the OVYM Women's Retreat, Earthcare Actions by Monthly Meetings, and the Clerk's Note on "Friends and United Diversity". October 2010 has the Clerk's Note on "Traveling in the Ministry," recap of Yearly Meeting, and the Yearly Meeting Epistles. June 2010 with Joint Youth Retreat, Teen News, Religious Education, and "Alive and Quiet-Come Be With Us" by the Clerk. February 2010 with articles on the survival of "Friends Journal," notes for Young Adult Friends, and "Fit for Freedom, Not for Friendship." October 2009 includes a recap of Yearly Meeting, "All God's Children got Shoes!" by the Clerk, and the YM Epistles. 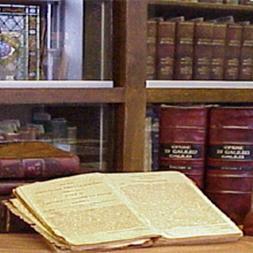 October 2008 with the Yearly Meeting recap, Epistles, and Nominating Committee report. 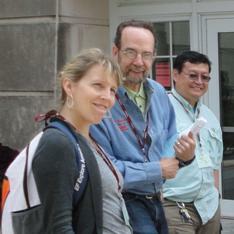 June 2008 announcing the 2008 Yearly Meeting's Annual Sessions at Earlham. February 2008 with Epistles and announcements. June 2007 announcing the 2007 Yearly Meeting and the Budget Committee report. February 2007 including an article by the Assistant Clerk and Monthly Meeting recommendations for religious education curriculum. October 2006 recapping the 2006 Yearly Meeting, Epistles, and coming events. June 2006 includes Queries for Ecological Mindfulness and an overview of the 2006 Yearly Meeting. February 2006 contains an announcement of the First OVYM Quaker Work Camp and Notes from the Annual Session Planning Committee. October 2005 contains a recap of the 2005 Yearly Meeting and a request for feedback from Monthly Meetings by the Peace and Social Concerns Committee on what actions have been taken by Monthly Meetings to address the Peace Testimony. June 2005 announced the 2005 Yearly Session with details of sessions and speakers. February 2005 contains an announcement of the Strengthening Worship, Strengthening Community workshop by Advancement and Nurture and Appointees to the 2005 World Gathering of Friends. October 2004 includes a recap of the 2004 Annual Session with the Epistles. February 2004 features Cindi Goslee's essay, "Roads and Paths," an invitation by Advancement and Nurture to utilize their services, and a recap of the Teen Trip to the Appalachian South Folk Life Center. October 2003 recapped the Annual Sessions and includes Epistles, a report by the Nominating Committee, and announced the availability of the position of Teen Secretary. February 2003 contained an essay by Deborah Jordan and Byron Branson on the growing global threat of terrorism and war entitled, "Friends' Peace Witness in a time of Crisis" discussing the FWCC gathering to consider our responses to these threats. February 2002 contained Lisa Cayard’s article, "Thoughts about Discipline," and an article on the American Friends Service Committee's No More Victim's Campaign.